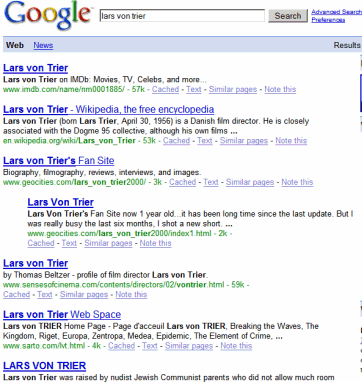 After Google introduced the universal search and Ask.com launched a unified interface, many people wondered if the time of the ten blue links has passed. Google was actually more conservative than Ask.com and didn't alter the search results pages too much: not many queries return image results, videos, news, maps or books. If you want more diversity in your search results, this Greasemonkey script replaces Google's ads with results from Image Search, Google Video, Wikipedia articles and definitions from Dictionary.com. There's no clever algorithm for the order of the panels, so you'll see them for every query that returns results. It's up to you to decide if the slower-loading multimedia results are more useful than Google's sponsored links. 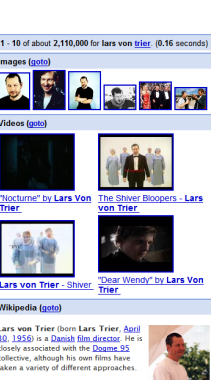 An interesting idea for this script would be to take into account Google's recommendations for specialized search engines (for "Lars von Trier" Google recommends to try Google News). To install the script, you need Firefox and Greasemonkey. Yes, but SearchMash doesn't expand the containers automatically, unless those results are very relevant. The implementation is much closer to Ask (compare SearchMash with Ask).